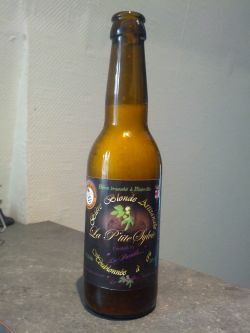 Bottle from Mi Orge Mi Houblon, Arlon, Belgium! Slight gusher. Pours strong golden orange with high, white, soapy head. Aroma of sugar and fruity hops. Taste of fruity hops, citrus and strong orange peel as well as some grapefruit. Very fizzy carbonation. Finish is fruity with lots of grapefruit and orange. Tap at Moeder Lambic Fontainas, 29/04/13. Hazed golden amber with a thin frothy white head. Nose is hops, sugar, apricot, light tropical notes. Taste comprises peach, grass, hops, tarte apricots, pineapple, red grapefruit. Medium bodied with fine carbonation lending towards light hop bitterness in the finish, Decent enough IPA. Hazy blond color, with excessive carbonation, and therefore too much head. Quite aromatic, with some yeast, some green grassy and sweaty hops, a bit of fruits. Dry mouthfeel; the malt flavor is quite good and rather spicy, with a good but strong yeast character; the bitterness level is high, and there are some hop qualities as well, grassy and earthy mostly; resiny final, long. Pleasant thirstquencher, bold; probably more an American Pale Ale or a Belgian IPA than a regular IPA, though. Tasted side to side with the Lylvie’cious, this one is cleaner, fruitier, more pleasant. Bottle at Vilvordia. Cloudy amber color, huge white head. Aroma of sour and spiced bubblegum. Taste is pure pine resin. Not bad. Little cloudy beer, small white head, unstable, non adhesive. Aroma: meaty, cheesy, exotic fruits. MF: soft carbon, medium body. Taste: grapefruit, piny, citrus, some exotic fruits, passion fruits, pineapple, cheesy. Aftertaste: bitter, grapefruit, bit piny, some citrus, very dry bitter ending. bottle @ VBPF’12. dorée/orangée, col blanc épais. Arôme herbacé, profile houblonné savonneux et agrumes/citronnelle. En bouche, profile fleuri agréable, fine amertume avec pointe d’épices sur un palais gardant une présence de levure et un fini grains malté qui reste là un peu la signature de nombreuses bières françaises. Un bel effort pour un houblon fruité mais qui pourrait être plus présent en amertume.